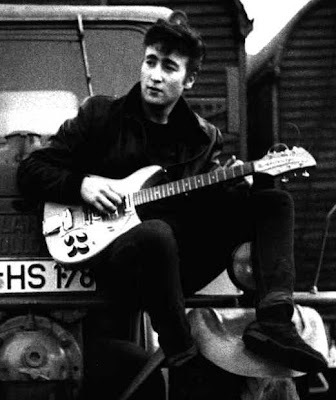 In 1960 when the Beatles were playing in Hamburg, John decided he wanted a really good guitar and chose the Rickenbacker 325. 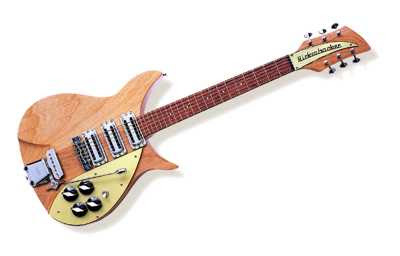 Lennon used this Rickenbacker from 1960 to '64 (It's last TV appearance occurring on the Beatles US TV Debut 'The Ed Sullivan Show') Over the course of those four years John changed the knobs and had it painted (perhaps he'd done it himself?) black. This is thought to be The Beatles manager Brian Epstein's idea to give the band a better look. John played this guitar live from 1960 to February 1964 when Rickenbacker gave him an updated model. This is how the guitar would have appeared when John first bought it in 1960. 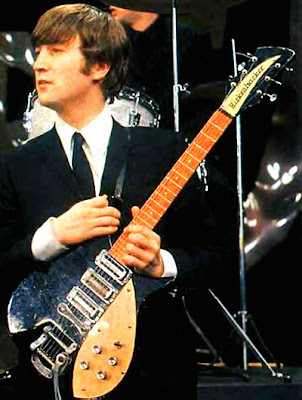 John with his Rickenbacker in Hamburg. John with the refinished guitar. This guitar now belongs to his son Sean Lennon.